Upon virus infection, host cells use retinoic-acid–inducible geneI I (RIG-I)–like receptors to recognize viral RNA and activate type I IFN expression. To investigate the role of protein methylation in the antiviral signaling pathway, we screened all the SET domain–containing proteins and identified TTLL12 as a negative regulator of RIG-I signaling. TTLL12 contains SET and TTL domains, which are predicted to have lysine methyltransferase and tubulin tyrosine ligase activities, respectively. Exogenous expression of TTLL12 represses IFN-β expression induced by Sendai virus. TTLL12 deficiency by RNA interference and CRISPR-gRNA techniques increases the induced IFN-β expression and inhibits virus replication in the cell. The global gene expression profiling indicated that TTLL12 specifically inhibits the expression of the downstream genes of innate immunity pathways. Cell fractionation and fluorescent staining indicated that TTLL12 is localized in the cytosol. The mutagenesis study suggested that TTLL12’s ability to repress the RIG-I pathway is probably not dependent on protein modifications. Instead, TTLL12 directly interacts with virus-induced signaling adaptor (VISA), TBK1, and IKKε, and inhibits the interactions of VISA with other signaling molecules. Taken together, our findings demonstrate TTLL12 as a negative regulator of RNA-virus–induced type I IFN expression by inhibiting the interaction of VISA with other proteins. The innate immune system builds up the body’s front line to defend against the invasion of microbial pathogens (1–3). Pattern-recognition receptors in the host cells specifically recognize various pathogen-associated molecular patterns, including DNA, RNA, proteins, lipids, and carbohydrates (2, 4–6). Successful recognition of pathogen-associated molecular patterns leads to the activation of the corresponding signaling pathway and the subsequent expression of type I IFNs and proinflammatory cytokines (2, 3, 7, 8). Multiple types of pattern-recognition receptor families have been identified, including TLRs, retinoic-acid–inducible gene I (RIG-I)–like receptors, cGAS, nucleotide-binding oligomerization domain–like receptors and C-type lectin receptors (4, 5). The RNA from RNA viruses, such as Sendai virus (SeV) and vesicular stomatitis virus (VSV), is recognized by RIG-I–like receptors, including RIG-I, MDA5, and LGP2 (1, 7, 8). RIG-I recognizes short double-strand RNA or 5-triphosphate panhandle RNA produced by the virus (9). Upon recognition, RIG-I changes its conformation and activates virus-induced signaling adaptor (VISA, also known as MAVS, IPS-1, and Cardif) on the outer membrane of mitochondria, as well as the associated endoplasmic reticulum and peroxisomes (10–15). TNFR-associated factor 3 (TRAF3) and TRAF6 are then sequentially recruited to the mitochondria and form a huge signaling complex (1, 7, 8, 16, 17). TRAF6 activates the NF-κB pathway through an IKK complex; and TRAF3 activates IRF3/7 transcription factors through phosphorylation by a TBK1/IKKε/NEMO complex (18). The activated IRF3 and NF-κB transcription factors then translocate into the nucleus and activate the transcription of type I IFNs (1, 7, 8, 19). The synthesized IFNs further activate a wide range of antiviral genes and the subsequent antiviral response. VISA/MAVS is one of the key adaptor proteins in the pathway, and is strictly regulated to ensure proper response to viral infection. Its polyubiquitination by RNF5 and a bicistronic transcript have been reported to regulate pathway activation (20, 21). Recently, a putative link between protein methylation and VISA/MAVS–dependent IFNB1 expression has been suggested. WD repeat domain 5 (WDR5) and WD repeat domain 82 (WDR82), two subunits of histone H3K4 methyltransferase complexes, were reported to regulate the virus-triggered type I IFN signaling (22–24). WDR5 is a common subunit of six histone H3K4 methyltransferase complexes, namely SET domain containing 1A/B (SETD1A/B) and myeloid/lymphoid or mixed-lineage leukemia 1–4 (22, 25–27); and WDR82 is a unique subunit of SETD1A/B complexes (28, 29). Both WDR5 and WDR82 are critical for the complexes’ constitution. In the absence of either protein, SETD1A/B complexes fall apart and the global H3K4 trimethylation is impaired (28). Interestingly, although both the WD40 proteins can be localized to mitochondria, they act in the opposite way to the activation of the RIG-I signaling pathway (23, 24). These studies on WDR5 and WDR82 in the RIG-I pathway raised the possibility that protein methylation is involved in the regulation of the RIG-I signaling pathway. To identify the involved protein methyltransferases or demethylases, a functional screen with the individual small interfering RNA (siRNA) library was carried out, and a predicted protein methyltransferase, TTLL12, was identified. TTLL12 contains a SET domain and TTL domain, and may have protein methyltransferase and tubulin tyrosine ligase activities (30). Recently it was characterized as being involved in regulating histone H4K20me3 and prostate cancer (30–32). 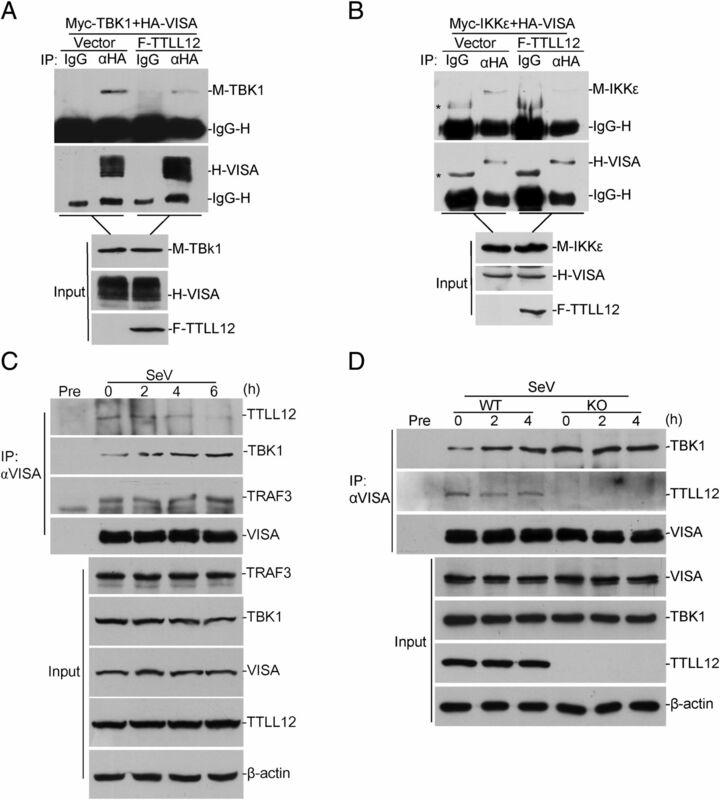 This study reports TTLL12 as a cytoplasmic protein that negatively regulates the activation of the RIG-I signaling pathway through inhibiting the interaction of VISA/MAVS with TBK1 and IKKε. All cell lines were purchased from the Cell Bank of the Chinese Academy. HEK 293, Hela, and HCT116 cell lines were cultured in DMEM supplemented with 10% FBS, 1% penicillin, and streptomycin. U2OS and THP-1 cells were cultured in RPMI 1640 supplemented with 10% FBS, 1% penicillin, and streptomycin. MitoTracker Red (Molecular Probes), Monoclonal Abs against Flag (Sigma), HA tag (Origene), Myc tag (ABclonal), EGFP (ABclonal), β-actin (ABclonal), phospho-TBK1-172 (Abcam), TBK1 (CST), polyclonal Abs against TRAF3 (Santa Cruz Biotechnology), phospho-IRF3-Ser396 (Cell Signaling Technology), and IRF3 (Abcam) were purchased from the indicated manufacturers. The rabbit antisera for TTLL12 and VISA were raised by the custom Ab service from ABclonal with the human full-length proteins purified from Escherichia coli. The cells were harvested and lysed in NP40 lysis buffer (50 mM Tris, pH 7.4, 150 mM NaCl, 0.5% NP40) or high salt lysis buffer (20 mM HEPES pH 7.4, 10% glycerol, 0.35 M NaCl, 1 mM MgCl2, 0.5% triton X-100, 1 mM DTT) with proteinase inhibitors. The supernatant was then incubated with protein G beads (GE Healthcare) and desired Ab at 4°C for 4 h. The beads were spun down and washed three times with a lysis buffer. The final drop of wash buffer was vacuumed out and SDS loading buffer was added to the beads followed by Western blot. The siRNAs were synthesized by GenePharma and transfected into the cells using Lipofectamine 2000 (Invitrogen). Then 72 h later, the cells were collected by centrifugation, and total RNA was extracted with an RNA extraction kit (Yuanpinghao) according to the manufacturer’s manual. Approximately 1 μg of total RNA was used for reverse transcription with a first-strand cDNA synthesis kit (Toyobo). The amount of mRNA was assayed by quantitative PCR. β-Actin was used to normalize the amount of each sample. Assays were repeated at least three times. Data shown are average values ± SD of one representative experiment. The statistical significance was calculated with a t test and p values are shown in the figures (*p value <0.05, **p value <0.01). The primer and siRNA sequences are as below. TTLL12 siRNA (siTTLL12.1 5′-GAGGAGAUGUGGAAGUUCA-3′; siTTLL12.2 5′-UCAACGACCUGGAUGACUA-3′). The knockout cell line was established in HCT116 cell lines as described (33). The gRNAs were designed using the CRISPR Design Tool (http://tools.genome-engineering.org). The oligo pairs encoding the 20-nt guide sequences were annealed and ligated into a plasmid with a U6 promoter, and the single clones were obtained with serial clone dilution and screened by Western blotting with the corresponding Ab. Cells were cultured on the cover slips and fixed with freezing methanol after being washed twice in PBS. The cover slips were then washed three times in PBS and blocked in PBS with 1% BSA for 10 min. They were hybridized with first and second Abs for 1 h, respectively. Then the slips were mounted with ProLong Anti-Fade kit (Invitrogen) and observed with fluorescent microscopy. Cells (∼1 × 105) were seeded on 24-well plates and transfected by calcium phosphate precipitation. The reporter plasmid of pRL-TK or pRL-SV40 Renilla Luciferase was added to each transfection to normalize transfection efficiency. A dual-specific luciferase assay kit (Promega) was used for luciferase assays. Assays were repeated at least three times. Data shown are average values ± SD of one representative experiment. Cells were transfected with siRNAs for 48 h, which was followed by VSV-GFP infection for 1 h, then cells were washed with PBS three times and replaced by a new medium. After 12–24 h, cells were observed by fluorescence microscopy and lysed for further immunoblot analysis with anti-GFP. To measure virus replication in cells, cells were infected with HSV-1 or VSV for the indicated times then supernatants were collected for plaque assays on monolayers of Vero cells seeded in 24-well plates. The cells were infected with serial dilutions of the suspensions for 1 h at 37°C. After that, 2% methylcellulose was overlaid, and the plates were incubated for ∼48 h. The overlay was removed and cells were fixed with 4% paraformaldehyde for 15 min and stained with 1% crystal violet for 30 min before plaque counting. The gene expression profiling was performed as previously described (34, 35). Briefly, cells from three biological replicates were mixed and the total RNA was extracted. The construction of mRNA-seq library was performed using an Illumina TruSeq library construction kit. As an initiation, 5 μg of total RNA was used, prepared according to the manufacturer’s instructions. The libraries were sequenced using HiSeq2000 for 100 bp paired-end sequencing. Quality control of deep-seq data were performed using FastQC, and low quality bases were trimmed. After that, data were mapped to hg19 genome reference by Tophat2 and a maximum of two mismatches were allowed. Cufflinks was used to find the differential expression genes. Gene ontology analysis was performed using DAVID (http://david.abcc.ncifcrf.gov) (36, 37). The sequences presented in this article have been submitted to the Gene Expression Omnibus under accession number GSE83849. To study the role of protein methylation in the regulation of anti-viral pathways, we used a siRNA library and screen for proteins regulating the activation of SeV-induced RIG-I pathway. The library contains all the known and predicted protein methyltransferases, demethylases, and their related genes. WDR82 was identified from the screen and reported as a repressor of the pathway activation by regulating TRAF3 polyubiquitination (24). A SET domain–containing protein, TTLL12, is identified from the screen. TTLL12 consists of SET and TTL domains. The SET domain usually contains lysine methyltransferase activity and the TTL domain catalyzes the posttranslational addition of a tyrosine to the C-terminal end of detyrosinated α-tubulin. However, one recent study suggested it may not contain the above activities, because it lacks several critical amino acid residues (30). To confirm the discovery, TTLL12 was knocked down by two independent siRNAs (siTTLL12.1 and siTTLL12.2) in HCT116 cells, and the quantitative RT-PCR result indicated that the IFN-β mRNA level induced by SeV was greatly increased after TTLL12 depletion (Fig. 1A). The above effect was further studied at different time points. The expression of several typical genes downstream of antiviral RIG-I signaling, IFN-β, OAS1, ISG54, MX1, and ISG56, were significantly elevated after TTLL12 knockdown (Fig. 1B, Supplemental Fig. 1A). When TTLL12 was overexpressed, the induced expression of these genes were repressed (Fig. 1C). The luciferase assay also indicated that TTLL12 repressed the activation of antiviral RIG-I signaling pathway in a dose-dependent manner (Supplemental Fig. 1B). A knockout cell line derived from HCT116 cell was generated with a gRNA/CRISPR method and the expression of IFN-β was greatly enhanced in the knockout cell line, in comparison with the parent cell line (Fig. 1D). 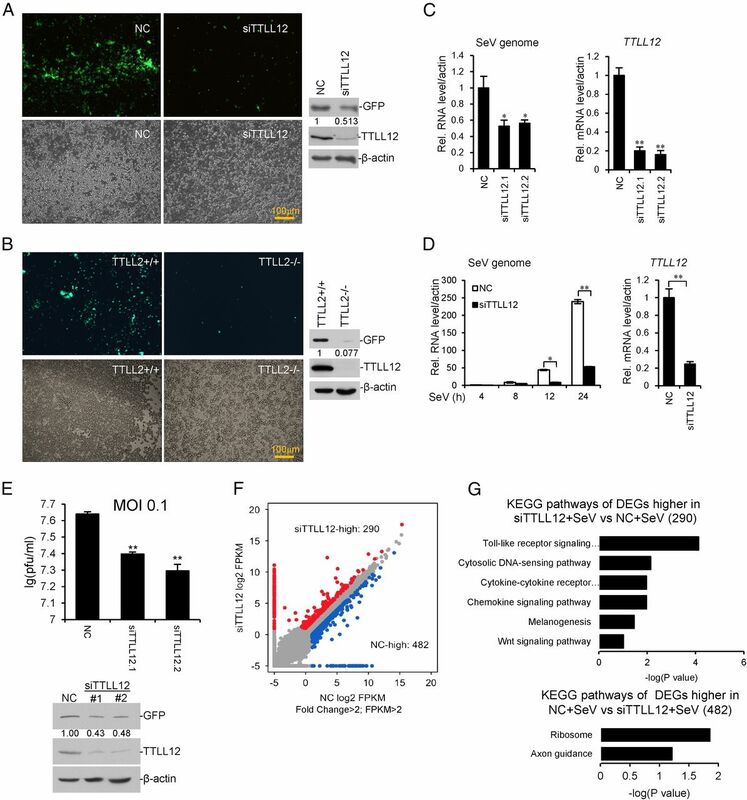 Then a TTLL12 expression plasmid was transfected into TTLL12−/− cells, and the reintroduction of TTLL12 successfully rescued the activated IFN-β expression back to the level in the wild type cells (Fig. 1E). A cell line survey of TTLL12’s function was carried out using HEK293, Hela, THP-1, and U2OS cell lines. The results indicated that TTLL12 has a similar ability in all the above cell lines (Supplemental Fig. 1D–G). 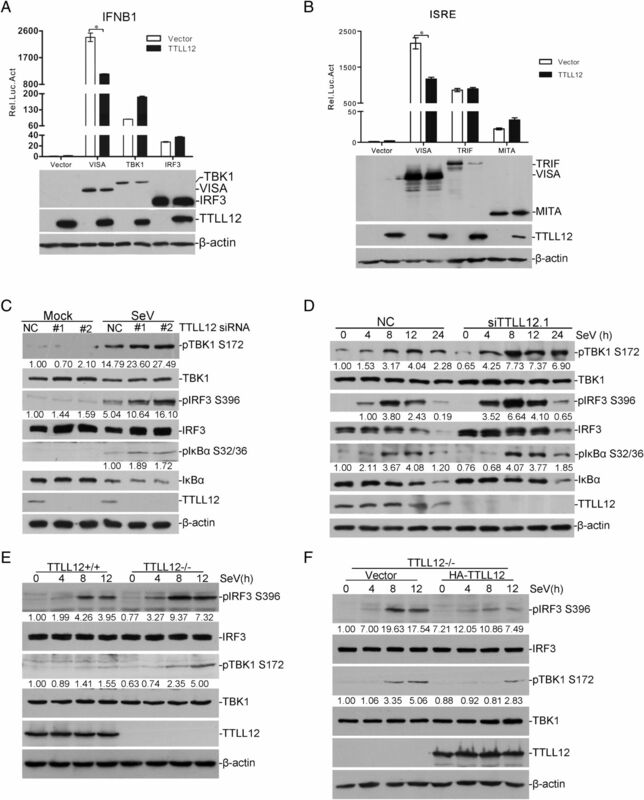 These data demonstrated that TTLL12 inhibits the activation of antiviral signaling induced by SeV in multiple cell lines. TTLL12 inhibits SeV-induced IFNB1 expression. (A) TTLL12 was knocked down by two different siRNAs (siTTLL12.1, siTTLL12.2) and the cells were treated with SeV. The mRNA level of IFNB1 was measured by RT-PCR. (B) TTLL12 was knocked down in HCT116 cell by siTTLL12.1, and the mRNA levels of IFNB1, OAS1, and ISG54 were measured after SeV treatment for the indicated time. (C) TTLL12 was over expressed in HEK293 cells and the mRNA levels of IFNB1, OAS1, and ISG54 were measured after SeV treatment for the indicated time. (D) TTLL12 was knocked out in HCT116 cell by CRISPR-gRNA. Then the cells were treated with SeV for the indicated time and IFNB1 mRNA was measured. (E) A plasmid containing F-TTLL12 was transfected into the above TTLL12−/− cell line. The indicated cell lines were treated with SeV for 8 h and IFNB1 mRNA was measured. *p < 0.05, **p < 0.01. To investigate if TTLL12 regulates virus replication in the cell, we used an engineered VSV virus with GFP integration in the genome. HEK293 cells were transfected with TTLL12 siRNA and infected with VSV-GFP. The depletion of TTLL12 significantly reduced the amount of green fluorescence, which represents VSV-GFP in the cell (Fig. 2A). Western blotting was performed to verify GFP expression (Fig. 2A). A similar experiment was carried out in TTLL12+/+ and −/− cell lines, and the reduction of VSV-GFP was also observed in TTLL12−/− cells (Fig. 2B). For further confirmation, cells were infected with SeV and the virus genome was measured with quantitative RT-PCR. Consistent with the previous observation, the amount of SeV genome greatly decreased after TTLL12 knockdown (Fig. 2C, 2D). The result of the plaque assay also supported TTLL12 deficiency by siRNA decreasing the plaque number (Fig. 2E). These results all indicated that TTLL12 is required for the proper replication of RNA viruses in the cell. TTLL12 deficiency enhanced the antiviral response and inhibits virus replication. (A) HEK293 cells were transfected with siTTLL12.1 and infected with VSV-GFP for 24 h. The amount of GFP was measured by fluorescent microscopy and Western blotting. The scale bar, 100 μm. (B) The same experiment as (A) was performed in TTLL12+/+ and −/− cells. The scale bar, 100 μm. (C) TTLL12 was knocked down by siTTLL12.1 or siTTLL12.2, and cells were infected with SeV for 24 h. The amount of SeV genome was assayed by quantitative RT-PCR. (D) TTLL12 was knocked down by siTTLL12.1 and the cells were treated with SeV for the indicated time. The amount of SeV genome was assayed by quantitative RT-PCR. (E) TTLL12 was knocked down by two different siRNAs and VSV-GFP was used to infect cells. Western blotting and plaque assays were then performed. (F and G) The control (NC) and TTLL12 knockdown cells (siTTLL12) were treated with or without SeV for 8 h. The gene expression profiles were analyzed by RNA-Seq. Red dots represent SeV-induced DEGs higher in siTTLL12 compared with NC, and blue dots represent those higher in NC. The enriched KEGG pathways of these DEGs were analyzed. *p < 0.05, **p < 0.01. To investigate the role of TTLL12 in antiviral response in a systematic manner, TTLL12 was knocked down by siRNA in HCT116 and the gene expression profile was studied with RNA sequencing. The analysis using the Kyoto Encyclopedia of Genes and Genomes (KEGG) database indicated that SeV-induced differential expressed genes (DEGs) are enriched in innate immunity pathways (Supplemental Fig. 2A), whereas TTLL12 knockdown induced DEGs involved in neurodegenerative diseases, metabolism, insulin, and p53 signaling (Supplemental Fig. 2B). We analyzed DEGs (fragments per kb of exon per million fragments mapped >2, fold change >2) between the SeV-treated control and SeV-treated TTLL12 knockdown cells (Fig. 2F). KEGG pathway analysis showed that the 290 DEGs that were more highly expressed in SeV-treated TTLL12 knockdown cells were enriched in antiviral pathways (TLR signaling, RIG-I signaling, cytosolic DNA-sensing pathway, cytokine-cytokine pathway, chemokine signaling, etc. ), but the 482 DEGs that were higher in SeV-treated control cells were not (Fig. 2F, 2G). We further overlapped the above 290 highly expressed DEGs with the SeV-activated DEGs in control cells. A total of 80 DEGs were identified and a heat map was created (Supplemental Fig. 2C, 2D). These 80 genes are also enriched in innate immunity pathways (Supplemental Fig. 2D), and include the typical antiviral genes, such as IFN-β/IFNB1, RIG-I/DDX58, OAS1, ISG54/IFIT2, ISG56/IFIT1, etc. (Supplemental Fig. 2C). Interestingly, TTLL12 expression further inhibits cell death induced by VISA/MAVS overexpression (Supplemental Fig. 2D, 2E). These data together demonstrated that TTLL12 has a global effect on repressing RIG-I signaling, and provided additional information for future studies. To explore the underlying mechanism, we used the luciferase reporter gene assay and studied TTLL12’s effects on IFN-β luciferase activity activated by the key regulators in the pathway. TTLL12 overexpression significantly repressed the pathway activated by VISA/MAVS; however, it did not repress that activated by TBK1 and IRF3 (Fig. 3A). It suggests that TTLL12 probably functions between VISA/MAVS and TBK1. Further analysis showed that TTLL12 overexpression did not repress the luciferase activity triggered by TRIF or MITA/STING (Fig. 3B, Supplemental Fig. 1C), suggesting TTLL12 functions are specific to the RIG-I signaling pathway. Interestingly, coexpression with TTLL12 significantly decreased the TRIF protein level without affecting the luciferase activity (Fig. 3B, Supplemental Fig. 1C). It will be interesting to investigate the roles of TTLL12 in TRIF-dependent pathways. To further confirm TTLL12’s specific role in the RIG-I signaling pathway, primary MEF cells were transfected with Ttll12 siRNA, and treated with HSV1 or IFN stimulatory DNA. The results indicated that Ttll12 has no effect on Ifnb1 expression induced by a DNA virus and IFN stimulatory DNA (Supplemental Fig. 3A, 3B). TNFα has also been applied in HEK293 cells and, interestingly, TTLL12 deficiency impaired the activation of NF-κB target genes (Supplemental Fig. 3C). All these indicate that TTLL12 specifically represses the RNA-virus–induced IFNB1 activation. TTLL12 inhibits the activation of RIG-I signaling pathway. (A) VISA, TBK1, or IRF3 was expressed in the cell with or without TTLL12. IFNB1 luciferase activity was measured. (B) VISA, TRIF, or MITA was expressed in the cell with or without TTLL12. IFN-stimulated response element luciferase was measured. (C) HEK293 cells were transfected with siTTLL12.1 (#1) or siTTLL12.2 (#2) siRNAs and then infected with SeV for 8 h. The levels of the indicated proteins were measured with Western blotting. The numbers beyond the bands represent the relative level of each modified protein in comparison with the corresponding total proteins. (D) HEK293 cells were transfected with siTTLL12.1 and infected with SeV for the indicated time. The levels of the indicated proteins were measured with Western blotting. (E) TTLL12+/+ and −/− cells were generated by CRISPR in HCT116 and infected with SeV for the indicated time. The levels of the indicated proteins were measured with Western blotting. (F) HCT116−/− cells were transfected with the HA-TTLL12 plasmid and infected with SeV for the indicated time. The levels of the indicated proteins were measured with Western blotting. The numbers beyond the bands represent the relative level of each modified protein in comparison with the corresponding total proteins. *p < 0.05. Then TTLL12 was knocked down by two independent siRNAs and the activation of the RIG-I pathway was measured with Western blotting using Abs specifically recognizing phosphorylated TBK1 and IRF3. Treatment with both siRNAs led to the increase of phosphorylated TBK1 and IRF3 levels after SeV stimulation for 8 h, suggesting a negative role of TTLL12 in the pathway (Fig. 3C). A study at different time points further indicated that TTLL12 depletion caused the increase of phosphorylated TBK1 and IRF3 4 h after SeV treatment, accompanied with a slight increase of phosphorylated IκBα (Fig. 3D). The TTLL12−/− cell line was generated with CRISPR-gRNA and phosphorylated IRF3 and TBK1 again increased with TTLL12 deficiency (Fig. 3E). A rescue experiment was carried out by introducing TTLL12 back into TTLL12−/− cells. The overexpression of TTLL12 inhibits the phosphorylation of TBK1 and IRF3, especially at 4 and 8 h after SeV treatment (Fig. 3F), which again demonstrated TTLL12 was a negative regulator of the SeV-induced RIG-I signaling pathway, which functions upstream of TBK1. After demonstrating TTLL12 was a negative regulator, we started to look for the proteins associated with TTLL12 in the pathway. An immunoprecipitation survey was carried out by coexpressing TTLL12 with key proteins in the pathway. The results suggested TTLL12 interacts with VISA/MAVS, TBK1, and IKKε, but not RIG-I, TRAF3, or IRF3 (Fig. 4A–F). The interactions between endogenous proteins were examined with specific Abs. The endogenous interaction between VISA/MAVS and TTLL12 was successfully detected from both directions, as well as that between TBK1 and TTLL12 (Fig. 4G, 4H). The endogenous interaction between IKKε and TTLL12 was only detected with TTLL12 immunoprecipitation (Fig. 4I), because the Abs we found for IKKε were not suitable for immunoprecipitation assays. TTLL12 interacts with VISA, TBK1, and IKKε. (A–F) Flag-TTLL12 was coexpressed with HA-VISA (A), HA-TBK1 (B), HA- IKKε (C), HA-RIG-I (D), HA-TRAF3 (E), and HA-IRF3 (F), respectively. Immunoprecipitation assay with anti-Flag was performed. (G–I) The interactions between endogenous proteins were studied by immunoprecipitation assay with the indicated Abs. (J–L) His-VISA (J), His-TBK1-NT (K), His- IKKε-NT (L), and GST-TTLL12 were expressed in bacteria and purified with affinity beads. GST-pulldown assay was performed to study the direct interactions between TTLL12 and other proteins. To study if TTLL12 interacts with the above proteins directly, GST-TTLL12, His-VISA, His-TBK1-NT, and His-IKKε-NT were expressed in the bacteria and purified with affinity columns. The proteins were then mixed together and GST pulldown assays were carried out as indicated (Fig. 4J–L). 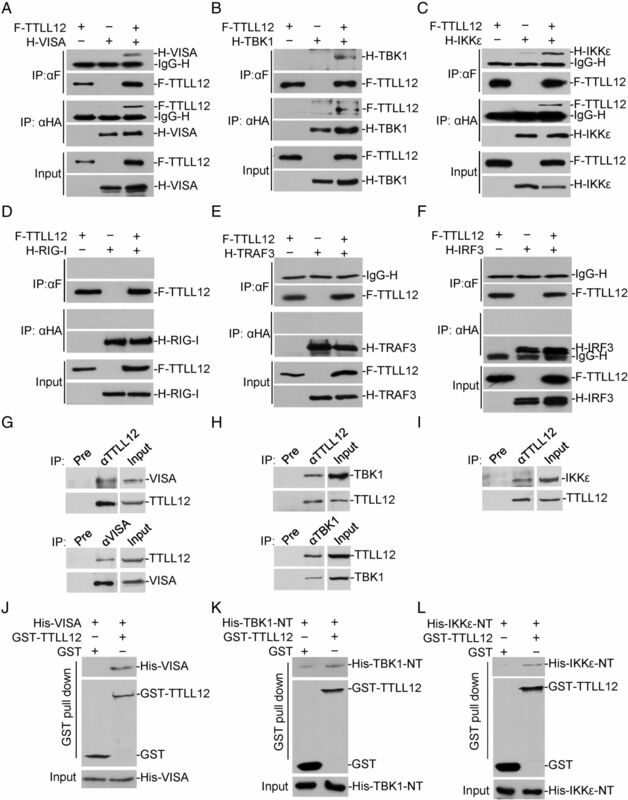 GST-TTLL12 successfully pulled down the three His-tagged proteins (Fig. 4J–L), indicating TTLL12 is able to interact with VISA/MAVS, TBK1, and IKKε directly. Many SET domain–containing proteins have been shown to contain the activity that methylates histones localized in nuclei. We separated the cells into cytosol and nuclear fractions and studied the localization of TTLL12. The Western blot results suggested TTLL12 was a sole cytoplasmic protein (Fig. 5A). The immunostaining of exogenously expressed TTLL12 also suggested TTLL12 is widely distributed in the cytosol, but not detected in the nucleus (Fig. 5B). This suggests that TTLL12 probably does not have the chance to access chromatin and methylate histones in cells. 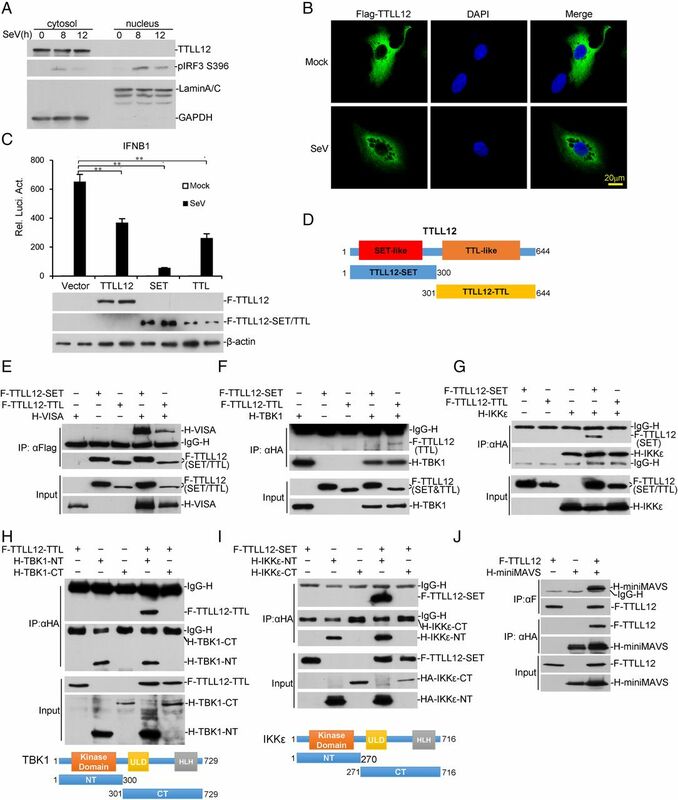 Both SET and TTL domains contain activities to modify proteins, however, a recent study suggested TTLL12 does not modify H3 and tubulin (30), which agrees with our study. The roles of TTLL12 domains in protein interaction. (A) HEK293 cells were infected with SeV and separated into cytosol and nuclear fractions. The distribution of indicated proteins were measured with Western blotting. (B) Cells were transfected with Flag-TTLL12 and treated with SeV. Fluorescent staining showed exogenous expressed TTLL12 is localized in the cytosol. The scale bar, 10 μm. (C and D) The cells were transfected with the indicated TTLL12 full length or truncations and treated with SeV. The activation of the RIG-I pathway was measured with IFNB1 luciferase activity. (E–G) Flag-tagged TTLL12 truncations were coexpressed with HA-VISA (E), HA-TBK1 (F), and HA-IKKε (G), respectively. The coimmunoprecipitation assay was performed as indicated. (H) TBK1 truncations were coexpressed with Flag-TTLL12 as indicated and the interaction was measured with immunoprecipitation. (I) IKKε truncations were coexpressed with Flag-TTLL12 as indicated and the interaction was measured with immunoprecipitation. (J) The corresponding sequence for miniMAVS was cloned and then expressed together with F-TTLL12 in HEK293. Coimmunoprecipitation was performed as indicated. **p < 0.01. We also made two constructs containing either an SET or TTL domain of TTLL12 and studied the impact on pathway activation. Both truncations inhibited the pathway activation as shown by luciferase reporter gene assay (Fig. 5C, 5D), suggesting that the two domains both have the inhibitory ability. When compared with wild type TTLL12, the repression abilities of the two truncations were not impaired. Then we made a point mutagenesis to mutate the conserved amino acids in the domains. The mutated amino acids were chosen based on the results of sequence alignment and the reported studies about the key residues for the enzyme activities of SET and TTL domains (Supplemental Fig. 4A). However, neither of the mutants showed any defect in inhibiting the pathway (Supplemental Fig. 4B). Based on this, we deduced that perhaps TTLL12 does not inhibit the activation of RIG-I signaling through modifying proteins. We then studied the interaction of the above TTLL12 truncations with VISA/MAVS, TBK1, and IKKε. The results showed that both the N- and C-terminal domains of TTLL12 interact with VISA/MAVS (Fig. 5E). Interestingly, TTLL12 interacts with TBK1 and IKKε through different domains, the N-terminal SET domain with TBK1 and the C-terminal TTL domain with IKKε (Fig. 5F, 5G). The domains of TBK1 and IKKε were also mapped for TTLL12 interaction. The results demonstrated that both TBK1 and IKKε interact with TTLL12 through their N-terminal kinase domains (Fig. 5H, 5I). Moreover, these domains of the two proteins have been shown to directly interact with TTLL12 (Fig. 4K, 4L). Interestingly, TTLL12 is also able to interact with miniMAVS (Fig. 5J), a truncated form of VISA/MAVS (21), but does not affect the cell death induced by miniMAVS (Supplemental Fig. 2E, 2F). Because the polyubiquitination and selective degradation of proteins are often involved in the regulation of RIG-I signaling, we measured the effects of TTLL12 on its interacting proteins. TTLL12 was coexpressed in the cells with VISA/MAVS, TBK1, or IKKε. The protein level of VISA/MAVS did not change with or without TTLL12 exogenous expression (Supplemental Fig. 4C). The same results were observed for TBK1 and IKKε (Supplemental Fig. 4C). In vivo ubiquitination assays were carried out with K48-only or K63-only ubiquitin. The polyubiquitination of Flag-VISA/MAVS did not change with or without TTLL12 expression, nor did Flag tagged TRAF3 or TBK1 (Supplemental Fig. 4D–F). Because VISA/MAVS exerts its function mainly through recruiting other signaling molecules, we speculated whether TTLL12 inhibits the interaction between VISA/MAVS and other proteins. HA-VISA/MAVS and Myc-TBK1 were exogenously expressed in the cells, with or without the coexpression of F-TTLL12, then a coimmunoprecipitation assay was performed with anti-HA Ab. HA-VISA/MAVS pulled down less TBK1 in the presence of TTLL12, suggesting TTLL12 inhibits the interaction between VISA/MAVS and TBK1 (Fig. 6A). Similar experiments with IKKε indicated that the exogenous expression of TTLL12 also inhibits the interaction between VISA/MAVS and IKKε (Fig. 6B). Our data suggest that TTLL12 inhibits the activation of the RIG-I signaling pathway through directly interacting with VISA/MAVS and repressing its interaction with other signal molecules. The coimmunoprecipitation assay of endogenous VISA/MAVS showed that the associated TTLL12 gradually reduced along with virus infection, whereas the associated TBK1 acted in the opposite way (Fig. 6C). To further confirm this, a coimmunoprecipitation assay between endogenous VISA/MAVS and TBK1 was performed. The results indicate that the interaction between the two proteins increased in TTLL12−/− cells (Fig. 6D). After virus stimuli, the VISA/MAVS associated TTLL12 decreased in wild type cells, correlated with an increased amount of VISA/MAVS associated TBK1. However, in TTLL12−/− cells, VISA/MAVS associated with TBK1 did not obviously change upon virus treatment (Fig. 6D). All these fit our model for TTLL12 in inhibiting the RIG-I signaling pathway. TTLL12 inhibits the interactions of VISA with TBK1 and IKKε. (A) Myc-TBK1 and HA-VISA were coexpressed in the cell with or without Flag-TTLL12. Immunoprecipitation assay showed that TTLL12 inhibits the amount of TBK1 associated with VISA. (B) Myc-IKKε and HA-VISA were coexpressed in the cell with or without Flag-TTLL12. Immunoprecipitation assay showed that TTLL12 inhibits the amount of IKKε associated with VISA. (C) HEK293 cells were treated with SeV for the indicated time and immunoprecipitation with VISA Ab was performed. The associated TBK1 increased along with pathway activation, whereas TTLL12 acted in the opposite way. (D) TTLL12+/+ and −/− cell lines were treated with SeV for the indicated time and immunoprecipitation with anti-VISA was performed. The precipitate was then examined with the indicated Abs. TTLL12 is a recently characterized protein and its abnormal expression has been linked with mitosis defects and prostate cancer. In the current study, we uncover its new role in regulating antiviral RIG-I signaling. TTLL12 represses the activation of the RIG-I pathway and enhances the replication of RNA viruses in cells. It directly interacts with VISA/MAVS and inhibits their interaction with TBK1 and IKKε. Our data suggest that TTLL12 is an important protein for repressing the interaction of VISA/MAVS and TBK1 in normal conditions; during virus infection, the interaction between VISA/MAVS and TTLL12 is impaired, which facilitates the interaction of VISA/MAVS with key molecules in the pathway and subsequent pathway activation. Our study revealed a novel mechanism for the regulation of antiviral response. We started our project with a screen to study the roles of protein methylation in regulating the RIG-I signaling pathway, and identified TTLL12 as a repressor. TTLL12 contains SET- and TTL-like domains but was reported without protein modification activity (30). Our results agree with Brants et al.’s report and suggest TTLL12 exerts its roles through regulating protein interactions. Both domains are able to repress pathway activation, and mutations of conserved sites did not impair inhibitory activity. The results of cell fractionation and immunostaining indicated it is localized in the cytosol, so it has no chance to modify histones. Although its absence affects the levels of histone H4K20me3 (30), it probably functions through indirect mechanisms. However, the above data do not mean protein methylation has no impact on the RIG-I signaling pathway. In fact, we have identified several other candidate protein methyltransferases able to regulate RIG-I pathway, and current data have shown that their methyltransferase or demethylase activity play important roles in pathway activation. Our results suggest that coexpression with TTLL12 leads to a lower expression of exogenous TRIF. It will be interesting to study the effects of TTLL12 on TRIF stability and related pathways. Moreover, the analysis of global gene expression profiling suggests TTLL12 is involved in the regulation of neuron degeneration, metabolism, insulin, and p53 pathways. Further studies on these processes will provide a much broader picture for TTLL12 in regulating human diseases. We thank Dr. Hong-Bing Shu of Wuhan University and Dr. Yan-Yi Wang of Wuhan Virology Institute for sharing reagents and manuscript discussion. This work was supported by grants from the Ministry of Science and Technology of China (2016YFA0502100), the National Basic Research Program of China (973 Program, 2012CB518700), and the National Natural Science Foundation of China to M.W. (31470771, 31521091) and L.-Y.L. (31370866, 31540013, and 31670874). The sequences presented in this article have been submitted to the Gene Expression Omnibus (http://www.ncbi.nlm.nih.gov/geo/query/acc.cgi?acc=GSE83849) under accession number GSE83849.
. 2010. SnapShot: pathways of antiviral innate immunity. Cell 140: 436–436.e2.
. 2006. Antiviral innate immunity pathways. Cell Res. 16: 141–147. 2014. Pattern recognition receptors: curbing gut inflammation. Nat. Rev. Immunol. 14: 583.
. 2010. Pattern recognition receptors and inflammation. Cell 140: 805–820.
. 2014. MITA/STING: a central and multifaceted mediator in innate immune response. Cytokine Growth Factor Rev. 25: 631–639.
. 2015. Viral RNA detection by RIG-I-like receptors. Curr. Opin. Immunol. 32: 48–53.
. 2014. An evolving arsenal: viral RNA detection by RIG-I-like receptors. Curr. Opin. Microbiol. 20: 76–81.
. 2004. The RNA helicase RIG-I has an essential function in double-stranded RNA-induced innate antiviral responses. Nat. Immunol. 5: 730–737.
. 2015. ECSIT bridges RIG-I-like receptors to VISA in signaling events of innate antiviral responses. J. Innate Immun. 7: 153–164.
. 2014. Ubiquitin in inflammation: the right linkage makes all the difference. Nat. Struct. Mol. Biol. 21: 297–300.
. 2013. MAVS recruits multiple ubiquitin E3 ligases to activate antiviral signaling cascades. eLife 2: e00785.
. 2015. Induction of USP25 by viral infection promotes innate antiviral responses by mediating the stabilization of TRAF3 and TRAF6. [Published erratum appears in 2015 Proc. Natl. Acad. Sci. USA 112: E5901.] Proc. Natl. Acad. Sci. USA 112: 11324–11329.
. 2010. Glycogen synthase kinase 3β regulates IRF3 transcription factor-mediated antiviral response via activation of the kinase TBK1. Immunity 33: 878–889.
. 2010. The E3 ubiquitin ligase RNF5 targets virus-induced signaling adaptor for ubiquitination and degradation. J. Immunol. 184: 6249–6255.
. 2014. A bicistronic MAVS transcript highlights a class of truncated variants in antiviral immunity. Cell 156: 800–811.
. 2011. MLL1/WDR5 complex in leukemogenesis and epigenetic regulation. Chin. J. Cancer 30: 240–246.
. 2010. WDR5 is essential for assembly of the VISA-associated signaling complex and virus-triggered IRF3 and NF-kappaB activation. Proc. Natl. Acad. Sci. USA 107: 815–820.
. 2015. WDR82 negatively regulates cellular antiviral response by mediating TRAF3 polyubiquitination in multiple cell lines. J. Immunol. 195: 5358–5366.
. 2010. Histone H3 lysine 4 (H3K4) methylation in development and differentiation. Dev. Biol. 339: 240–249.
. 2005. WDR5 associates with histone H3 methylated at K4 and is essential for H3 K4 methylation and vertebrate development. Cell 121: 859–872.
. 2012. MLL1, a H3K4 methyltransferase, regulates the TNFα-stimulated activation of genes downstream of NF-κB. J. Cell Sci. 125: 4058–4066.
. 2008. Molecular regulation of H3K4 trimethylation by Wdr82, a component of human Set1/COMPASS. Mol. Cell. Biol. 28: 7337–7344.
. 2008. Wdr82 is a C-terminal domain-binding protein that recruits the Setd1A histone H3-Lys4 methyltransferase complex to transcription start sites of transcribed human genes. Mol. Cell. Biol. 28: 609–618.
. 2012. Tubulin tyrosine ligase like 12, a TTLL family member with SET- and TTL-like domains and roles in histone and tubulin modifications and mitosis. PLoS One 7: e51258.
. 2012. Serum-autoantibodies for discovery of prostate cancer specific biomarkers. Prostate 72: 427–436.
. 2010. Tubulin tyrosine ligase like 12 links to prostate cancer through tubulin posttranslational modification and chromosome ploidy. Int. J. Cancer 127: 2542–2553.
. 2013. Genome engineering using the CRISPR-Cas9 system. Nat. Protoc. 8: 2281–2308.
. 2016. Global histone modification profiling reveals the epigenomic dynamics during malignant transformation in a four-stage breast cancer model. Clin. Epigenetics 8: 34.
. 2016. The EZH1-SUZ12 complex positively regulates the transcription of NF-κB target genes through interaction with UXT. J. Cell Sci. 129: 2343–2353.